Sitting at the center of the Olive Riviera on a gulf between Mirabello and Cornicello, Bardolino is by far one of the most enchanting places on the lake. 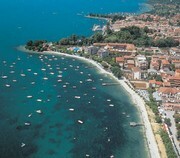 Internationally famous for its production of Bardolino wine, the town offers a wide range of hotels, apartment complexes, camping sites, resorts and sports facilities (soccer fields, tennis courts, tamburello, horseback riding, target shooting, trapshooting, bocce courts, miniature golf, sailing etc.). Sitting at the center of the Olive Riviera on a gulf between Mirabello and Cornicello, Bardolino is by far one of the most enchanting places on the lake. Internationally famous for its production of Bardolino wine, the town offers a wide range of hotels, apartment complexes, camping sites, resorts and sports facilities (soccer fields, tennis courts, tamburello, horseback riding, target shooting, trapshooting, bocce courts, miniature golf, sailing etc.). The towns of Cisano and Calmasino are also part of the district. Local products (wine, oil, fish, etc.) are used in its delicious, wholesome cuisine, which can be found in elegant restaurants or in trattorias further inland. What better reason for taking a stroll or setting off on an excursion! The Romanesque church dating from the end of the 9th century is the most important religious construction in the area. Just off the Gardesana state road, it has a salient facade with the central section raised to almost twice the height of the two side sections, a balcony above the rectangular entrance, an oculus and a cornice of rampant arches in brick work along the double slopes of the roof. Inside there are three aisles with four pairs of low columns. The main apse holds the remains of a crypt from the early Middle Ages. Interesting frescoes covering about 200 sq. m. feature scenes of the Apocalypse and the Recovery of the Cross. The church belonged to the S. Zeno monastery of Verona that had a chapel in Bardolino for the collection of the tithes, a “canipa” for the recovery of agricultural products, property and dues, also for fishing. The Romanesque-style palatine chapel dates back to the 8th and 9th centuries. The interior has a Latin Cross layout, with six red marble columns surmounted by Corinthian capitals. Among the frescoes are the Madonna with Child and Saint Peter. The church near Sem on the road to Rocca di Garda dates back to the 9th century. It was the church of the ancient S. Colombano convent or priorate on Mount Bardolino, which belonged to the Bobbio Monastery. This museum was set up by Oleificio Cisano del Garda to display a very special production process. In it, a water-powered oil press from the mid 19th century has been reconstructed. Also on display are an ancient lever press, stone wheels, screw presses, utensils and furnishings. Explanations in several languages accompany the exhibit. The museum, which is on the Gardesana road, is open from 8:30 a.m. to 12:30 p.m. and from 3:00 to 7:00 p.m., except Sunday afternoons. For information contact: Museo dell’olio – 37010 Cisano di Bardolino – phone: 045/7210356. Santa Maria Parish Church, located in Cisano, the church dates back to the 12th century. Built inside an existing 8th century construction, it still preserves from the period the transennas of the facade, the portal and balcony with a 16th century fresco of the crowned Virgin Mary, the semicircular apse and the lower section of the bell tower.